The following article is an introduction to some of the research done by the RE Living History Group into daily life in the Detachment. More detailed information can be found by following the links on our Index page. Histories of British Columbia usually treat the deeds of the Royal Engineers with awe. And the accomplishments of these soldiers, both in engineering and in public service, were indeed remarkable. Yet often the Engineers themselves are portrayed as Victorian-era supermen, a "Noble band of British Heroes" transforming the wilderness. Such reverence is obvious in the idealized 1967 Rex Woods oil painting of the Engineers at work, which can be seen on our homepage. An examination of the letters and journals of the Engineers puts a human face on these heroes. Officers often squabbled, enlisted men sometimes drank or deserted, and the work was plagued by accidents, often fatal. An 1859 photograph of the real Engineers at work, also on our homepage, provides a striking contrast to the romanticism of the Woods painting. What follows is a glimpse into the daily lives of the soldiers and their families – our attempt to show something of the real people behind the legend. In 1858, when the Columbia Detachment of Royal Engineers was created, each of the 160 members was handpicked from volunteers. There were several compelling reasons why these 'sappers' (as Engineer privates were known) opted for service on the far side of the world. First, each man would receive 30 acres of free Crown land in British Columbia upon completion of service, later increased to 150 acres in appreciation of the men's work. 30 acres, let alone 150, was an astronomical windfall which no labourer could hope to attain at home in England. Next, the Columbia Detachment allowed all its married men to bring their wives and children. The usual practice of the British army when sending a unit overseas was to allow only one soldier in six to bring his wife, excess wives and all children being left behind. 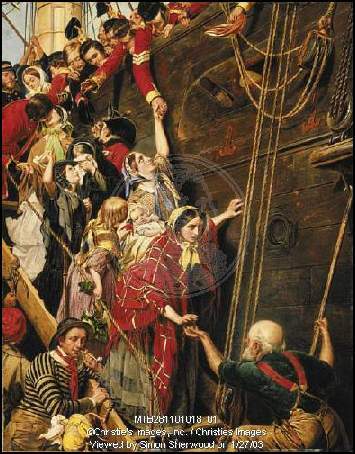 But no less than 36 women and 38 children left with the Detachment in 1858 on board the troop ship Thames City1. Third, as in California in 1849 and Australia in 1851, the Fraser River gold rush of 1858 produced a worldwide “gold fever” which was likely a motivation for some. At least 11, and possibly as many as 15, soldiers of the Detachment deserted within six months of arriving in British Columbia. So our heroes were drawn to British Columbia by some very mundane motives, including ambition, familial attachment and (for a few) greed for gold. According to the annual volumes of Lloyd's Register of Shipping for 1857/58 through 1865/66, the British ship THAMES CITY was built under Lloyd's Register of Shipping Special Survey at Sunderland, in 1856. 557 tons; 142.0 x 29.5 x 17.5 feet (length x beam x depth of hold). Her master was J. Glover, she was owned by "R'nthwte" (a name I cannot expand), and registered in Sunderland. Only the annual volumes of Lloyd's Register volumes for 1857/58 and 1858/59 give a destined voyage; in both cases, this is to India. The entry for the THAMES CITY in the annual volume of Lloyd's Register for 1865/66 is posted "wrecked". I cannot find any reference to this wreck in Palmer's Index to the Times (London), but the ship was not an important one.